National Nutrition Month is a time to reflect on your personal food habits, think about ways to improve your diet, think about what you are doing well and how you could make some adjustments towards healthier choices. Although the field of nutrition is a constantly changing science, some principles for healthy eating have remained the same for years: balance, variety and portion control. While these three concepts may seem too simple to guide your food choices, think about what your diet would look like if you ate a wide variety of foods, didn’t overdo on any one food group or food item, added in activity daily so that your body is in energy balance (ie. 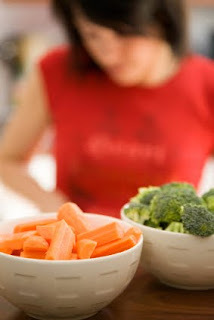 Calories in= calories out), and chose portions that made your body feel energized, not sluggish after a meal. Sometimes the most simple concepts can offer a powerful combination when put into action. Grow: Include more foods that grow in the ground in your everyday diet. This means fruits, vegetables, grains, legumes, nuts and seeds. Go to the produce section first at the grocery store; plan salads, soups, and stir-fry’s on your menu; pack a piece of fruit in your briefcase or purse; go to a local farmer’s market or start your own garden at home with a few simple edible items. Slow: In our fast paced lives of instant messaging and instant information, we get accustomed to moving 60 miles a minute and tend to carry that speed over to how we approach food: order quickly, ready-in-a-minute foods, eat in the car, grab and go snacks. People who take the time to sit down, chew, and take a few slow, calm breaths before eating, tend to eat less and enjoy the eating experience more. Our bodies take about 15-20 minutes to send a message from the stomach to the brain that we are full. If you have ever had that over-stuffed feeling after a meal, you likely didn’t allow enough time for this signal to travel to your brain before eating more. Try having a family meal at least a couple times a week. Involve your whole household in the process; your children will not only feel like they have contributed to the family but will feel more invested in the meal, and thus, may be more inclined to enjoy the food. Sitting down with family and friends for a meal not only helps improve your diet, but also offers the important bonus of connecting and conversing with those you close to you. Now is the right time to put these ideas into action! Changing habits takes time so try making one change each month instead of expecting yourself to implement all of these ideas at once. One change a month translates into 12 healthier habits over the year.